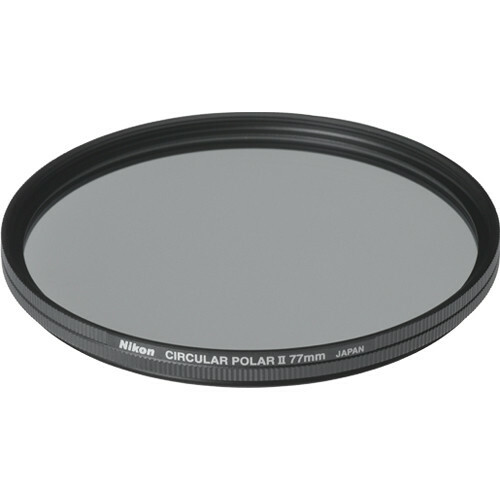 Box Dimensions (LxWxH) 4.173 x 3.858 x 0.787"
77mm Circular Polarizer II Filter is rated 4.9 out of 5 by 209. Rated 5 out of 5 by Urq from Awesome piece of glass. I wanted a slim filter with front threading. I was concerned at how flimsy this thing could have been, but upon using it, I have no worries at all. The rotation is very smooth and stays in place well. The range of polariztion is consistent. Though careful with the wide angles (Tokina 11-16 for me)as you will get the unwanted coloring of sky in parts of the frame due to the polarization. I considered the Singh Ray and B&W, but this is definitely the best bang for the buck. I also like the neutral aspect to this one as I shoot raw and can add the warming effects post. If you screw it on too tight, it is a little more difficult to remove. Rated 5 out of 5 by Jeffrey G. from Predictable Nikon Quality It came down to this filter and the B+W. The B+W was significantly cheaper with nearly the same specs - MRC, slim, ect... My choice came down to external threads on the Nikon and trusted Nikon optics. I've had several other filters, most of which have a goofy slip on cover which is virtually worthless. The typical Nikon lens cover fits snug and secure - no worries of loosing it slung over the shoulder. This is my first 77mm slim filter. It is extremely hard to remove for people with big fingers. Nearly impossible to get off without scotch tape to give friction on mm thin brass ring. Very happy with the sharpness, contrast and plastic carrying case. Rated 5 out of 5 by Al from A Quality Polarizer for MWide Angle Lens I needed a new Circ. Polarizer for a recently acquired WA lens for my D7000. I purchased this Nikon Circ. Pol. because of its thinness and the expected high quality of the Nikon glass. I was not disappointed. The glass is of high quality, the sky is evenly darkened during use and in spite of a large hood and the thin construction I can still easily turn the polarizer when in use. Moreover the hood still fits onto the lens with the Polarizer attached. I am very pleased with this expensive but high quality 77mm Nikon Polarizer and would recommend it to anyone, especially if using a wide-angle lens. Rated 5 out of 5 by FamilyMan1955 from What took me so long?! I do photography each year in Africa and Europe and for some crazy reason didn't ever use a polarizing filter! A friend convinced me to buy this filter and WOW, every picture I take around the water and with significant clouds as a main element in the image are radically better! I groan every time I look back at my previous pictures, although they are still terrific, and simply wonder what might have been!!! The filter attaches and operates very easily on both of my Nikon f/2.8 zoom lenses (24-70 & 70-200 II) that I use with this filter. The small loss in speed is easily offset by the resulting IQ in appropriate applications. Rated 5 out of 5 by Anonymous from Does not Clip I recently purchased a Nikon 16-35 f/4 lens. The primary use of this lens is landscape photography using a polarizer for sky effect and reducing reflections. I had a competing brand polarizer and it clipped the image on the corners. Over the weekend I ran a test. I checked sharpness by viewing the image at 100% with the filter on and the filter off. I could se no discernible difference. There was no clipping of the conners when the lens was set to 16mm. I could tell no shift in colors. All in all I am very satisfied with this filter. Rated 5 out of 5 by Northeast Mountain Man from Worth the price Bought this Nikon to replace the B&W equivalent, which I returned because the B&W would neither thread properly into my lens nor rotate for the polarizing effect without using such force that I was afraid it would literally warp the lens barrel out of alignment. This Nikon screws into the lens (a Nikon 24-120mm f4) without any fuss, and the front rotates with ease even in cold outdoor temperatures. The Nikon polarizer has a slimmer mount compared to other filters I've tried, while still retaining filter threads on front. This has the benefit of reducing vignetting in the corners of wide angle lenses while also allowing additional filters such as ND grads to be mounted in front. Note I do not see any vignetting at all on my Nikon 24-120 at 24mm. Cleaning thispolarizer is a little more challenging than others I've experienced, perhaps due to the multicoating, but a little lens cleaner or pre-moistened lens tissue cleans it right up. Rated 5 out of 5 by Colin from If you are serious, get this filter Nikon does not make the least expensive POL (polarizing) filter, but they make probably the best one. Why: Several reasons: 1. Their filters are wider on the front than the rear, meaning you won't get vignetting with wide angle lenses. 2. They have a clever design that makes it easier to install, remove, and use than any other manufacturer. 3. They are coated. Because the POL filter material is plastic (it cannot be made in glass), all POL filters consist of two pieces of glass with the POL material sandwiched in-between. This means that to coat a POL filter, you have to coat four sides, instead of the usual two. 4. They are amongst the most neutral in-color POL filters made. Many POL filters seem to have a cool cast to them. 5. Many say they are more efficient, meaning they let more light pass than most POL filters. All POL filters block more than one stop of light, and sometimes as much as two stops. In my experience, Nikon POL filters typically absorb less light than then other brands. 6. Unlike some brands, NIkon POL filters hold the glass in by a circular ring. This stresses the glass less than using a threaded ring. What more do you need to say. Rated 5 out of 5 by The Joker from The Skies Are Fantastic I first used this at the Pensacola Renaissance Festival. It was a very sunny day and I was surrounded by tons of people and events to photograph, to include a falconry demonstration. This filter was easy to use and rotate to the needed setting, all the while remaining secure on the lens. It threaded on easily with no hint of cross threading. Very happy with the how all of the photos came out with the skies excellent outcome. I don't know if it is the 'best' polarizer, but the Nikon polarizer is color-neutral, and of good build quality (brass construction). Not sure what the question is but the Nikon CPOL II is top of the line. Compared to the B-W, the Nikon has a higher polarizing effect, smoother rotation, and is thinner. Easy one finger set inside a sun hood. Once set, it stays put. Pricey but worth it. Get step-up rings to cover other lens filter sizes. Can anyone tell me how thick this filter is? I'm trying to compare it to other slim filters. Eyeballed with a ruler (not accurately measured with micrometer) its 1/4 or about 7mm thick. will this filter fit a Sigma 17-50mm? Yes this filter is compatible with the Sigma 17-50mm lens. would this fit the D5300 camera with lens that came with camera? Want to give as gift. I believe the 5300 kit lens takes a 52mm filter, so this would be much too large. However, if you expect to invest in other lenses, you're better off buying a larger polarizing filter, and then purchase a step-down ring so you can use the polarizer on all your lenses. I don't stack filters often but will be need to with a protective UV because of need to add &amp; remove quickly without removing a protective filter in a harsh environment- any experience with vignettes &amp; this filter with this at focal lengths 20-24 mm? Camera: Nikon d750Lens: Nikon 20mm f/1.8, Nikon 24-120mm f/4.0Stacked filters: Nikon NC 77mm + Nikon 77mm Cicular PolarizerResult: Noticeable vignetting. DXO PhotoLab compensate automatically at NEF level (based on individual lens profile) about 90% of vignetting. Is the Nikon 77mm Circular Polarizer II Filter made of Brass or Aluminum? It is heavy enough I'm pretty sure it is brass. What ever metal it is harder than aluminum. Don't ever get aluminum as it is way too soft and eventually it will ding the thread so will be unusable unless you are into repairing threads with a very fine file and magnifying glasses, which I have also done. Have anyone used this filter with Nikon AF-S NIKKOR16-35mm f/4G ED VR? Does it cause vignetting at 16mm, 18mm, 20mm or 24mm?